Hydroseeding provides the easiest startup, a healthier looking lawn long-term, and an affordable budget. It is also the most common way to install a new lawn. Sod installation will give you an instant lawn, but will require a bit more maintenance. Sod typically is more expensive, but can still be a reasonable cost depending on the size of your lawn. Hand-raked seeding is the most cost-effective way to start your lawn, but has no covering for the seed, which makes it difficult to keep it watered enough without allowing the seeds to dry out. Lawns with hills or embankments can sometimes be a challenge. Retaining walls can help give you a more practical and functional lawn by leveling out the surface of the lawn. 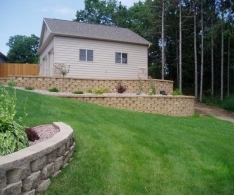 Premium Lawn can design and install your retaining wall - whether it's around windows of your home to allow for fire escapes or in your yard to hold back banks and prevent soil erosion. Wish you knew what your yard could look like with some great landscaping? Premium Lawn can show you in the design process. You'll be able to see your ideas on paper and we'll make recommendations on which plants / foliage is best for your lawn or outdoor area. If you're not sure you can do everything all at once, that's ok. We're flexible and can do your project if needed to work with your budget or time schedule. Replace old / dead plants or trees, or add more to your existing landscaping. Premium Lawn Service will take care of finding the right plants for your space and install them hassle free. Add more usable living space to your home with an outdoor patio. Walkways also add dimension, texture, and function while protecting your landscaping. Outdoor lighting around your home creates an inviting and secure atmosphere after dark. Low-voltage lighting can be used on walkways, to showcase exterior features of the home, accent landscaped areas, or provide safety / security. They come complete with timers and energy-efficient bulbs to maximize energy savings. Every couple of years, overseeding your lawn can combat the effects of older grass that starts to die over time. Premium Lawn Service can overseed your lawn in one of two ways - aerating and seeding (most common) or slit-seeding. Either method will provide good results to start new growth in older areas of your lawn. Your landscaped areas can be nicely finished off with permanent continuous concrete curbing. This alternative to pavers or rubber edging gives a nice edge for mowers, eliminates trimming, and is available in many different patterns and colors. 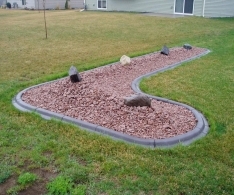 Water features add unique interest to your yard. 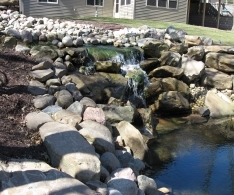 Relax in your outdoor space and enjoy a pond, waterfall, or sculpture. Low-maintenance waterless features are also available.